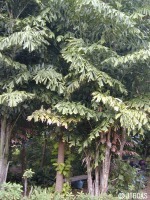 Medium-sized palm tree, found in evergreen forest, or cultivated as an ornamental plant, stem unbranched, up to 10 m high with distinct nodes. Leaves bipinnate, large; leaflets truncate, often cuneiform, dentate at the top. Inflorescence axillary, pendant, with monoecious flowers; spathes several, tubular, imbricate; spadix shortly peduncolate, often ramose. Flowers spicate, solitary or 3-4 together, the male flowers developing before the females, which are subglobose and smaller. Fruit a drupe, globose. Seeds 1-3, subglobose or compressed. The core from the inner part of the top of the stem, palm heart, is edible after cooked. The plants are normally grown from seeds and transplanting to the permanent site.